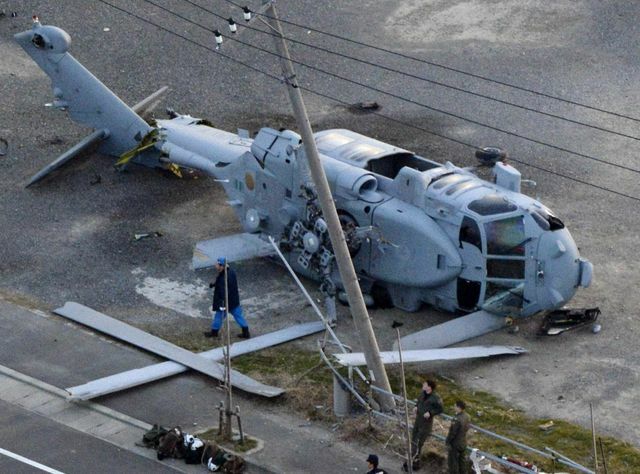 An MH-60S Knighthawk out of NAF Atsugi crash-landed in a vacant, undeveloped lot with no fatalities 10 miles from Yokosuka Naval Base. Two of the four crewmembers of the Navy helo are being treated in a Japanese hospital in Yokosuka. The Knighthawk was assigned to Helicopter Sea Combat Squadron 12 (Golden Falcons), attached to Carrier Air Wing Five with the USS George Washington. Stars and Stripes reports that prior to today’s incident, a Knighthawk had landed in the Red Sea while attempting to land on a destroyer in less-than-optimal weather conditions. The Navy is in the process of investigating the cause of the crash.